After a bit of a rough day yesterday, I sit here coming at you at 2:30 a.m. wide awake and yet sleep deprived. Have I mentioned before that I’m an occasional insomniac? The problem has improved since I started my treadmill routine last fall, and then added on the yoga once a week this year, but sometimes there’s just too much stress that even a good work out can’t cure. Yesterday was one of those days. 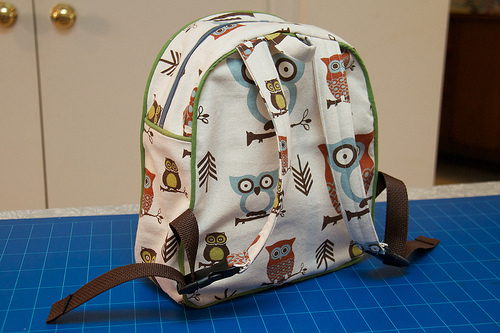 So perhaps it’s appropriate to post a couple projects featuring owls, since right now, I kind of feel like one. Recently I discovered the fabulous online fabric retailer, Tonic Living, where I found most of the above fabrics. Besides their excellent wide-ranging selection of not only quality quilt fabrics but also outdoor and upholstery fabrics, they offer FREE SHIPPING to folks like me who are in the GTA (I believe the deal is available to those with postal codes that begin with L or M, although its not stated on their ‘about us’ section of the site — it must come up when you’re in the check out) if you order over $50, which is of course not hard to do at all when you’re buying fabric. 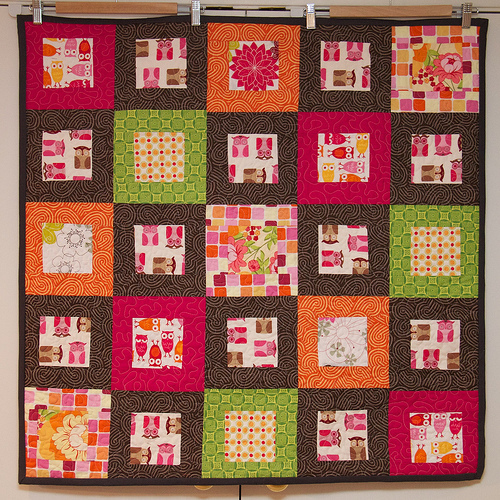 The baby quilt above was made for my friend Alice, who is a couple months away from having her second child, this time a girl. 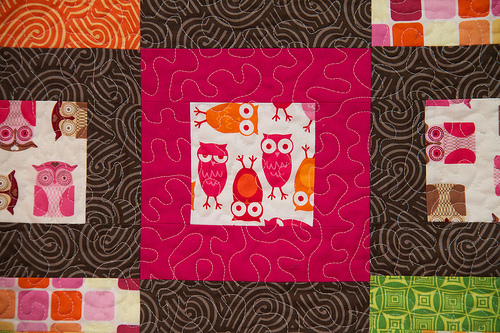 Alice is a little owl crazy, as is her little 3 and a half year old Calvin, so it wasn’t hard to know what direction I should go with in choosing fabrics for this quilt. I also wanted to steer clear of typical pastel baby colours, which are so not Alice’s thing. Oranges and limey greens are way more her style. "Aromatherapy" and "Zen Garden" by Patty Young. 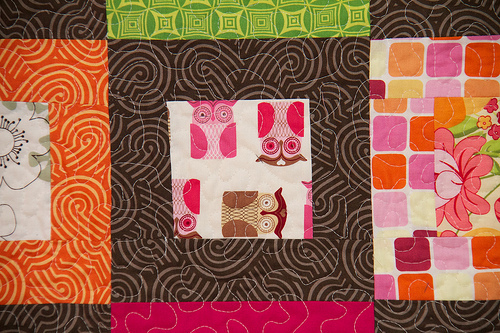 "Kiss Me Owls" by Suzanne Ultman and "Zen Garden" by Patty Young. “Meadowsweet Citrus” by Michael Miller. The square with the lime green two-tone pattern is the only fabric pair I’m not certain about the designer or manufacturer. I got those through the monthly stash-building subscription I have going with Sew Sisters, another fabulous quilt fabric retailer I order from often. When I found the above owl prints, I also came across this super cute print, called “Night Owl” (not sure who the designer is) in a heavier 10 oz. duck canvas. 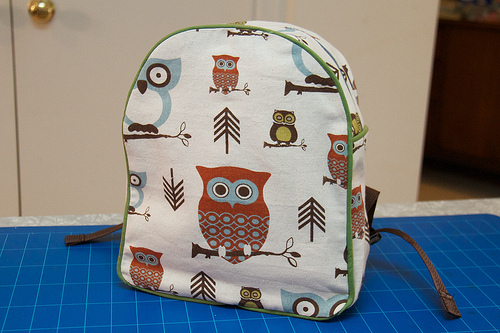 I thought it would make for a really cute little tote bag for Calvin, who I thought might appreciate a little present all for him that features owls. Then I found this adorable toddler backpack pattern by Rae Hoekstra of made-by-rae.com, and knew it was perfect for the little man. This was a unique project that tested my sewing skills; I’d never sewn piping into anything before, and really it’s the first zipper I’ve done in likely 20 years. It was actually ridiculously easy and the project took only a couple of hours to complete. I’m telling you, buying that new Baby Lock was the best investment I’ve made in years. I can’t believe I held out for so long before doing it. All I want to do now is sew all the time. I gifted both these projects to Alice on the weekend at a clothing swap we had planned, when we decided last minute to take advantage of our all being together to give the mama-to-be some well wishes, and they were of course, a huge hit. I already know some other little people in my life who just might need toddler backpacks of their own! 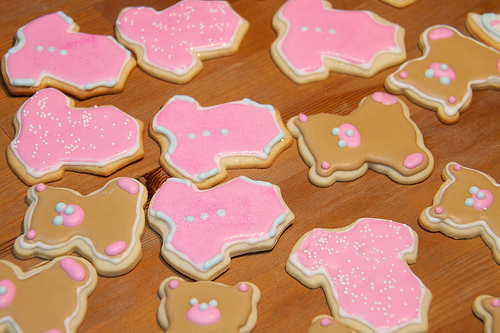 And lastly, check out the yummy cookies I whipped up for the event! My icing skills are improving ever so slowly! fantastic fabric! And as an L postal coder, I’m heading off to check them out. The backpack and cookies are to die for – nice job. 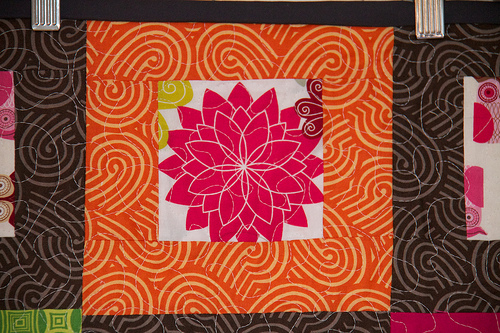 That’s a gorgeous quilt Sar! I love the colours and theme! That’s a fabulous project! And the backpack? I am hardly able to contain my squees. It’s awesome! Calvin LOVES his owl backpack, the quit is amazing and beautiful – and thanks for the non=pastel colour choice 😉 and hot dam those cookies were fine! And I am so in awe of how you find time for all of this?! Sarah you rock!